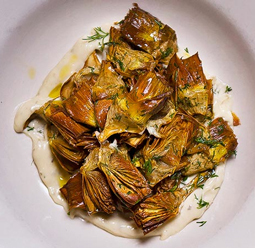 Crispy Baby Artichokes with Lemony White Anchovy Aioli - A recipe from Savor California, the online showcase for extraordinary gourmet foods and beverages from California. Thank you to Tasting Table for turning us on to this recipe adapted from Mike Friedman, The Red Hen, Washington, D.C. In a large bowl, combine the water and the lemon juice. Trim ¼ inch off the stem and ¼ inch off the top of each artichoke. Snap off any tough outer leaves to reveal the inner pale yellow leaves. Using a vegetable peeler, peel away the tough outer layer of the stem. Halve the artichokes lengthwise and place in the lemon water. Repeat with the remaining artichokes. In a small bowl, using a large whisk, beat the mustard, capers, anchovies, garlic and egg yolk. While whisking, gradually add the oil, drip by drip, until the mixture is well emulsified. Whisk in the water and lemon juice and set aside. Note: The aioli can be made the day before; cover with plastic wrap and refrigerate. Bring it to room temperature before serving. Drain the artichokes in a colander in the sink. Line a baking sheet with paper towels and set aside. In a 4-quart saucepan, heat the canola oil to 350° over medium-high heat. Working in two batches, fry the artichokes until the leaves are golden brown and the heart is tender, about 5 minutes. Using a slotted spoon, transfer artichokes to the paper towel-lined baking sheet to drain. In a large bowl toss the hot artichokes with the dill and salt. Transfer to a serving bowl. Serve the anchovy aioli on the side.